The nation of Jugdral has been ravaged by war, and the Thracian army emerge as the victors. You play as the army of the rightful prince Leaf, fighting to reclaim his home. Lead each character in your army into the battlefield, gaining experience by battling the enemy forces and increase the strength of your characters. 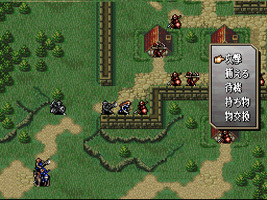 This was the last commercial release for the Super Famicom, just over nine years after the system was released.